The LILLEbaby Complete is a soft, structured carrier with a variety of seating options for children from newborn to toddlerhood. This carrier can be used in a front carry both rear and forward facing or on your back. 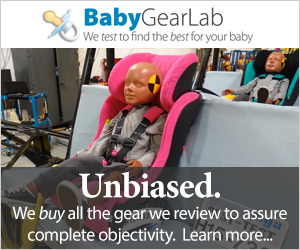 Unfortunately, the Complete is one of the more expensive options in this review, which may be justifiable if it offered more for baby's comfort or the comfort of the wearer. Wearers had trouble adjusting the carrier and learning how to narrow the seat for little one's comfort. This difficulty results in frustration, hasty adjustments, and short duration trips. We think at this price that a carrier should be easy to use and comfortable enough for everyone that you never want to take it off. LILLEbaby is grounded in Scandinavian design principles of stylish, functional and obtainable. The company was founded by designer, Lisbeth Lehan, with the goal of creating baby products that reduce hassle, simplify the process, and improve quality of life. For their first product, they spent researching and designing the Complete to be what they hoped would be comfortable, functional, comfortable, and stylish. The LILLEbaby Complete is soft structured carrier with straps and buckles that allows for front and back carry positions. The following comparison chart shows the overall score for each carrier in this review. The Complete earned the second lowest score in the group. The information in the sections below includes details on how the Complete performs compared to the competition. Overall scores are derived from individual metric scores. Our little testers had trouble being truly content in the LILLEbaby Complete. The Complete earned a 6 of 10 for baby comfort. It has a softer mesh fabric than other mesh we saw in this review, but overall baby comfort is still lacking. This carrier has some adjustability designed for little ones of different ages and sizes but it still struggles for true comfort for everyone and our testers need some help staying content in the carrier indicating some discomfort. The Complete earned a 4 of 10 for Parent's comfort. This score is the second lowest for the group indicating it is not very comfortable to wear, especially for longer periods of time. Larger parents (mostly men) liked the wider padding on the shoulder straps and waistband, but more petite users (mostly women) felt the padding was uncomfortable and remarked that the super thick padding on the waistband rubbed while walking and dug into legs while sitting. This a problem during front carry (above left). Making adjustments for comfort was difficult as the straps are stiff and some testers ever did find a comfortable "fit", especially in a back carry position (above right). The Complete earned a 4 of 10 for ease of use. This carrier is not user-friendly out of the box with very few testers being able to adjust the straps intuitively. The directions are particularly confusing for changing to "Narrow Seat." Adjusting the LILLEbaby Complete is difficult when wearing the carrier and testers struggled with on the go changes due to stiff straps. We had difficulty adjusting the straps and putting the carrier on for back carry and eventually determined that putting in on front carry and rotating is really the easiest way to do it for many testers. Overall, getting everything adjusted was cumbersome and frustrating. The LILLEbaby Complete is harder to clean than some of the competition because it is harder to spot clean and must hang to dry. The Complete earned a 5 of 10 for ease of cleaning. It is not the easiest to keep clean despite being machine washable in warm water. While we appreciate the machine washability it would be nice if it was tumble dry instead of hanging dry. However, more importantly, it isn't that easy to keep clean on the go with poor spot cleaning and taking longer to dry than some of the competition. Amazon $122.99 - 12% off!